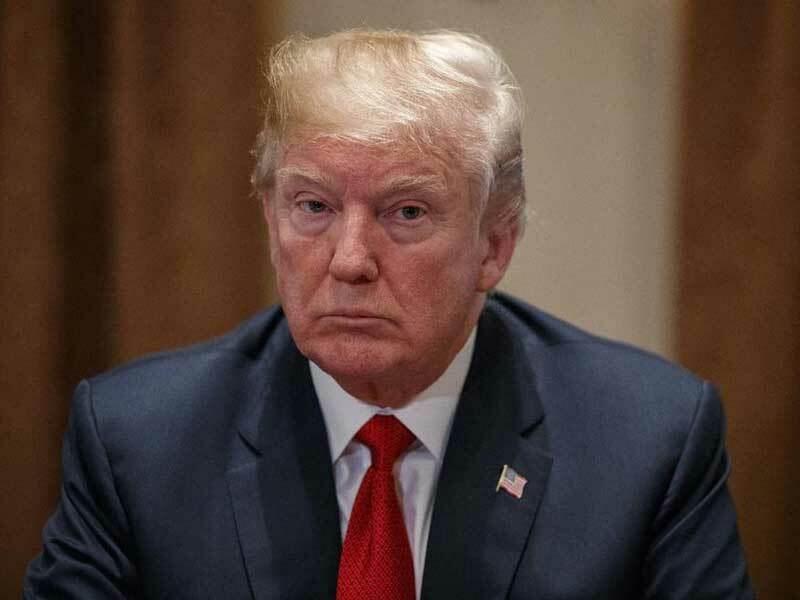 [yt_dropcap type=”square” font=”” size=”14″ color=”#000″ background=”#fff” ] O [/yt_dropcap]ne gets the impression that US President Donald Trump could lead his nation and world at large to a new world without conflicts. However, if he misleads the world by his mischief as a usual US leader, then, like his predecessors have done before him, would betray the humanity beyond Mideast and the humanity would be the silent victim to war mongers and looters. US President Donald Trump has met Pope Francis on May 24 morning at the Vatican for a short private audience on the third leg of his overseas trip before going to Europe to conclude his madden tour as the custodian of White House. Trump is now due to meet Italy’s president and prime minister. He will then fly to Brussels for a NATO summit. The US President arrived for the meeting along with his wife Melania, daughter Ivanka and Jewish son-in-law Jared Kushner after their visit to Israel. The meeting was keenly awaited as the two men have already clashed at a distance on issues including migration and climate change. Trump and his entourage arrived at the Vatican n the morning just before 08:30 local time; the meeting was arranged last minute which resulted in the early start time. The US president was greeted by Archbishop Georg Ganswein, the head of the papal household, and escorted by the Swiss Guard from the Vatican courtyard to the offices of Pope Francis. Journalists who covered the initial greeting said the pair were cordial with each other. Trump told the Pope “it is a great honour”. The two men spoke privately for about 20 minutes before returning to a public arena to exchange gifts. Though this is their first meeting, they’ve already sparred. During the election the Pope on a visit to the Mexico-US border said that people who only think of building walls instead of bridges were not Christians. Donald Trump described those comments as disgraceful, and accused the pontiff of being a pawn of the Mexican government. But on Wednesday both men were seeking to find common ground. It is hard to think of two more contrasting characters than Pope Francis and President Trump. On one hand, the Jesuit who has made his mission the championing of the poor and dispossessed; on the other the property developer who has championed getting rich, and surrounded himself with billionaires in his cabinet. Interestingly, Trump gave the Pope a boxed set of writings by the black civil rights leader Martin Luther King. 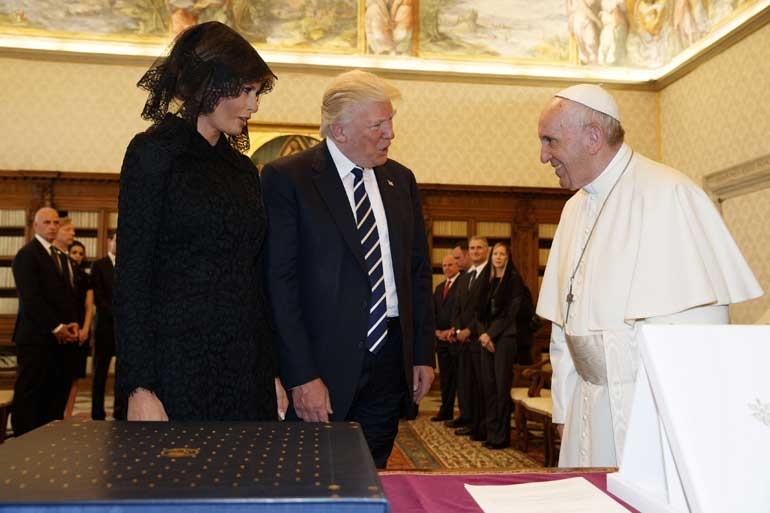 The Pope gave Trump a signed copy of a message he delivered for World Peace Day, along with some of his writings about the need to protect the environment. “Well, I’ll be reading them,” Trump told him. Trump seemed subdued during their initial meeting, while Pope Francis was not as jovial as he sometimes is with world leaders. The two men appeared much more relaxed at the end of their 30-minute private meeting. He was granted a short private audience with the head of the Catholic Church on the latest leg of his overseas trip. The two men have in the past clashed on issues such as migration, climate change and a Mexico-US wall. On international affairs, their “exchange of views” covered the “promotion of peace in the world through political negotiation and interreligious dialogue”, and highlighted the need to protect Christian communities in the Middle East. Trump vowed to help Israelis and Palestinians achieve durable peace, as he ended the Middle East leg of his tour. The US leader began his foreign trip with a two-day stop in Saudi Arabia over the weekend, urging Muslim countries to take the lead in combating radicalization. Western powers make maximum benefits of the illogical Saudi-Iran rift. After the first leg of his trip in Saudi Arabia, President Trump seems to hope that Sunni Arab countries might be part of any solution between Israel and the Palestinians. Without doubt the Saudis and the Israelis are talking, because Iran is their shared enemy. But the Saudis have had their own Arab peace plan on the table for the last 15 years, offering full peace and recognition of Israel in return for the establishment of a Palestinian state on the entire territory of the West Bank and Gaza with its capital in East Jerusalem. That is something the current Israeli government is not prepared to concede. Antipathy towards Iran is the one thing that Washington’s disparate allies in the region agree upon. So, bashing of Tehran has been a prominent theme for Trump both in Saudi Arabia and now in Israel. Hostility to Iran is the glue that binds what some would like to believe is an emerging coalition between Israel, Saudi Arabia and the smaller Gulf States together. But how far it really promises to shake up the sterile politics of the region is unclear. A common purpose to contain Iran is one thing but can it really extend to bringing a new diplomatic dawn to the region? For Trump, criticising Tehran performs multiple functions. It allows him to sound tough on the world stage. Tougher than his predecessor, Barack Obama, who, he believes, signed one of the worst deals in history in reaching the nuclear accord with Iran. It enables him to reassure both the Gulf Arabs and Israel at one and the same time. And it underscores the narrative of a common front emerging in the region that – at least according to the Trump administration – holds the enticing promise of a new dynamic in the log-jammed struggle between Israel and the Palestinians. And, of course, it also sends a warning signal to Tehran about aspects of its policy in the region that Washington sees as contrary to US interests. It is also not a policy of nuance or one that contends with complex reality. How does it look providing ringing endorsements to the Saudis and selling them a fortune of weaponry, when they are engaged in a brutal war in Yemen? The Trump government’s almost brash belief in the possibilities of a wider Middle East peace seems to be at variance with most experts who know the region well. They argue neither the Israelis nor the Palestinians are ready to make the hard compromises necessary to achieve a lasting peace. Some have argued that rather than focusing on a comprehensive deal that would have to resolve the hard questions like Jerusalem and refugees, the goal should be less ambitious; an interim deal that might mark the re-starting of a longer term diplomatic process. But it is not clear yet if the new US administration has the patience for this kind of worthy diplomacy. And this brings us back to Iran. Just what is the Trump administration’s policy towards Tehran? Indeed the re-election of Iran’s President Hassan Rouhani may complicate matters further. 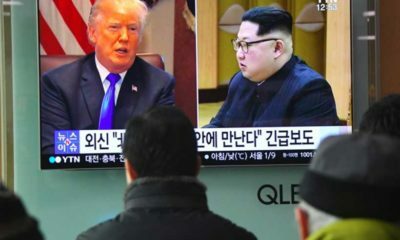 He was perceived as the more moderate candidate after all, even if the Supreme Leader and the Revolutionary Guard still retain a key grip on foreign policy. President Rouhani is already encouraging some European politicians to talk of the search for an opening to Tehran. That may not go down well in Washington. But then there is the very complexity of the region that Trump’s rhetoric often overlooks. Interestingly, the Iraqi government is now one of Washington’s main allies against so-called Islamic State. But Iran too is a strong supporter of Baghdad and has deployed militia forces and advisers on the ground to aid the war effort. President George W Bush sponsored a peace conference in Annapolis in 2007, which for a while was hailed, in vain, as a major step towards the establishment of an independent Palestinian state alongside Israel. President Bill Clinton presided over the moment in 1993 at the White House when Yasser Arafat and Yitzhak Rabin exchanged a historic handshake and signed the Oslo peace agreement. At the end of his presidency in 2000, a make or break summit failed and was followed by years of violence and unrest. In recent times every American president also brings with him new hopes and fears for Israelis and Palestinians. In 2009 President Barack Obama trying to re-set relations with Arabs and Muslims. In the process he alienated Israelis and its leaders never forgave him. His first act as president was to appoint a Middle East envoy whose peace mission, in the end, failed. Nobel foundations have played mischief by offering Obama the coveted Nobel Peace prize even before he could do nay thing meaningful in his presidency in the proper way. Nobel committee denied any chance for Middle East peace by almost imposing on him Peace Award that made him ineffective in solving the Mideast puzzle by establishing Palestine. Perhaps had he not got the Nobel Peace Award, Palestine would have become a sure reality as he supported the Palestine cause towards the end of tenure at White House. .
Now President Trump, who sees himself as the world’s best dealmaker, says he would like to pull off the world’s toughest deal. How quickly Trump would be able to get Israeli leadership on board to settle the world’s deadliest conflict in the name of Israel war on Palestine would determine the success of his efforts to end the blood bath in Palestine where Palestinians have been facing cruelty form Israel’s military. The US leader began his foreign trip with a two-day stop in Saudi Arabia over the weekend, urging Muslim countries to take the lead in combating radicalization. In his final speech, at the Israel Museum in Jerusalem, President Trump also identified himself, his government and the USA four-square with Israel. He repeated, to lots of applause, that he would never let Iran have nuclear weapons. Israel has a substantial -illegally obtained from USA – and officially undeclared nuclear arsenal. Trump became the first serving American president to visit the Western Wall in Jerusalem, the holiest place where Jews can pray. That is being taken by Jews as his support for Israel. Trump became the first serving American president to visit the Western Wall in Jerusalem, the holiest place where Jews can pray. That is being taken as support for Israel. The wall is in East Jerusalem, which Israel annexed after it was captured 50 years ago and which most of the world outside Israel regards as occupied land. Some will interpret the fact that the president declined the Israeli prime minister’s request to accompany him as a sign of support for the status quo view that it is occupied territory. President Trump, in his speech, did not pick up the cue. After making many warm remarks about Israel, which earned him standing ovations, he said he believed that the Palestinian President, Mahmoud Abbas, was serious about making peace. One pointer to a potential difference with Israel’s hawkish PM Netanyahu came at the museum. In his opening remarks, Netanyahu said that if the bomber in Manchester was Palestinian, and his victims were Israelis, the Palestinian Authority would be paying a stipend to his family. He was referring to a Palestinian Martyrs’ fund. It pays pensions to people it regards as victims of the occupation, including the families of individuals who have been killed attacking Israelis. There is also a fund to support Palestinians who have been imprisoned by Israel. The Palestinians have compared the payments to the salaries Israel pays to soldiers. Senior Israeli politicians and officials in the room disagree. Netanyahu said earlier this year that President Abbas lied to Donald Trump when they met in the White House. That is an important disagreement. If President Trump’s hopes ever become negotiations about substance he will find that there are many others. The two sides are far apart on the main issues, like the future of east Jerusalem, the borders of a Palestinian state and the fate of Palestinian refugees. President Trump brought with him to Jerusalem most of his top advisers, dozens of vehicles and his own helicopters. The White House booked the entire King David Hotel for the president and his entourage. The Israeli and Palestinian authorities cleared the main roads of Jerusalem and Bethlehem for the movements of his armed and mighty motorcade. 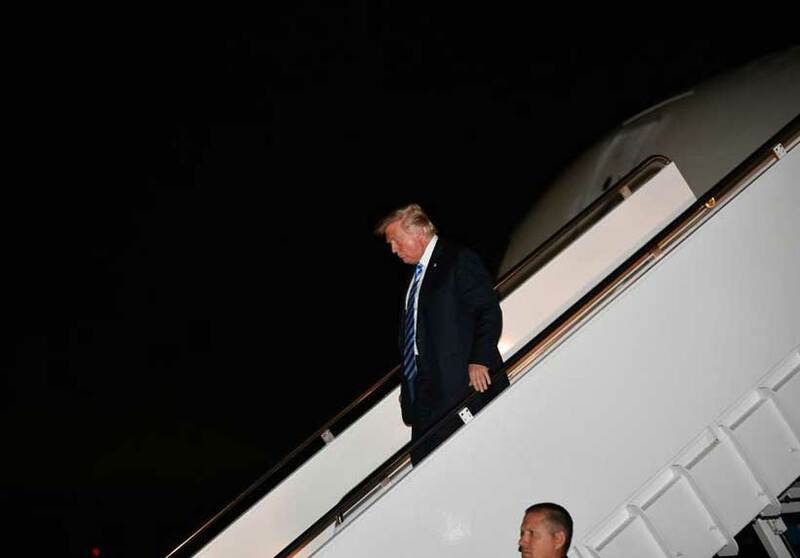 President Donald Trump has arrived in Brussels ahead of a NATO summit where he will push the security alliance’s 28 members to meet their spending obligations and do more to combat terrorism. The fight against terrorism will be top of the agenda at the May 25 meeting in the Belgian capital, a stop on Trump’s first trip abroad since he took office in January. It is believed that the bombing in Britain that killed 22 people has been engineered to further strengthen the NATO and its brand state terrorism encompassing Islamic world. The whole idea for all this is to brand Islam a terrorist religion and to force Islamic regimes to kill Muslims as terrorists in order to reduce Islamic populations and loot their resources, valuable assets. . . . . This is Trump’s first visit to Europe since taking office in January. Security has been stepped up across Rome, with the areas around the Vatican City, the Italian presidential palace and the American ambassador’s residence, where Trump is staying, temporarily closed to traffic. Trump called NATO “obsolete” during the US presidential campaign last year, saying it was not doing enough to fight terrorism. He has also chided some members for not following NATO guidelines on spending. This visit will be about damage limitation with the fervent hope of establishing some kind of transatlantic chemistry. 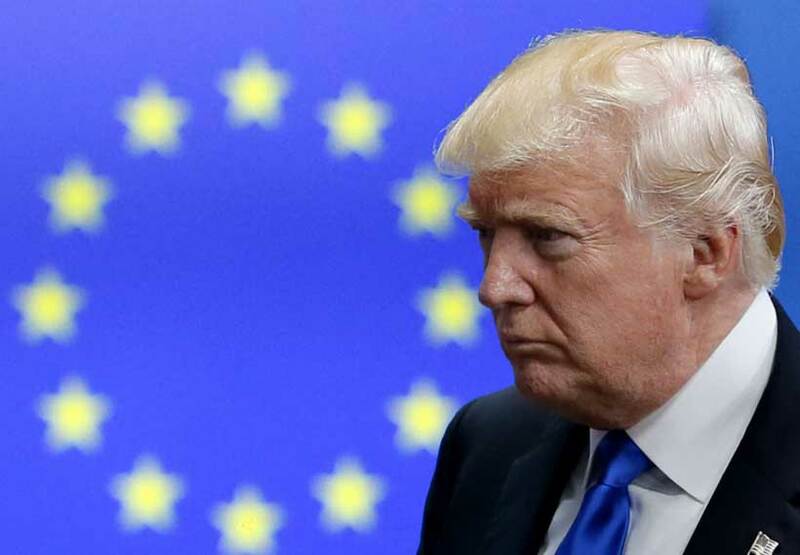 The tone in Brussels has gone from off-the-record sneering when the erratic and unpredictable Trump first won the November elections, to outright concern now that the implications of his presidency have begun to sink in. Despite the heavy police presence, about 100 anti-Trump protesters held a rally in one of Rome’s squares on Tuesday evening. Significant protests are also expected in Brussels where he will meet EU and NATO officials. Trump is now in Brussels for talks with NATO and EU officials. He will also hold meetings with Belgium’s King Philippe and Prime Minister Charles Michel. Later on Wednesday, Trump flew to Brussels, where significant protests are expected. 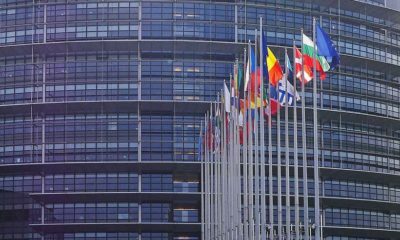 For the EU and for NATO, this visit is about damage limitation with the fervent hope of establishing some kind of transatlantic chemistry, the BBC’s Europe editor Katya Adler says. She adds that the tone in Brussels has gone from off-the-record sneering when the erratic and unpredictable Trump first won the November elections, to outright concern now that the implications of his presidency have begun to sink in. Trump was joined not only by his wife, daughter and son-in-law but also Secretary of State Rex Tillerson and National Security Adviser HR McMaster. Both Melania and Ivanka Trump were dressed in black with their heads partially covered, in keeping with a traditional Vatican protocol that is no longer expected to be rigorously observed. Melania, a Catholic, asked the Pope to bless her rosary beads. Following his visit to the Vatican, Trump was moving on for talks with Italian President Sergio Mattarella and Prime Minister Paolo Gentiloni in what is his first visit to Europe since taking office in January. Security has been stepped up across Rome, with the areas around the Vatican City, the Italian presidential palace and the American ambassador’s residence, where Trump is staying, temporarily closed to traffic. Despite the heavy police presence, about 100 anti-Trump protesters held a rally in one of Rome’s squares. After the meeting between President Trump and the Pope, the Vatican said there had been an “exchange of views” on international issues, while Trump said they had had a “fantastic meeting”. Trump also tweeted: “Honor of a lifetime to meet His Holiness Pope Francis. I leave the Vatican more determined than ever to pursue PEACE in our world.” He arrived in Europe from Israel and the Palestinian territories, where he vowed to try to achieve peace in the region. Today the world is at a cross roads. Palestinians and Kashmiris like other oppressed nations, brutally occupied colonist and imperialist regimes, continue to be strangled to death by democracy militaries aided by high precision terror equipment. President Trump has given a new hope for the survival of occupied masses with some dignity. . Whether or not he could be trusted remains a trillion dollar question. Enemies of Islam have succeeded creating a solid wedge between Saudi Arabia and Iran and through that a vertical split in Islamic world. That trend may not end any soon because Saudi led Sunni Arab states view Iran as their worst foe- even worse than Israel and all anti-Islamic rogue states operating in coalition to destroy Islam. Interestingly, a few Muslim regimes also led support to the destructive format of anti-Islamic forces globally. Absolute foolishness and fatal ignorance are not a part of Islamic faith. Nor reluctance to mold the mindset of Arab leaders could be an excuse to let the enemies of Islam invade energy rich Arab world. Donald Trump deserves global appreciation as he has said he is “more determined than ever” to pursue peace in the world after meeting Pope Francis at the Vatican. The main problem is Israel does not want to resolve the conflict. Trump is right on one point. This is a conflict that badly needs settling. If that is not possible, there needs to be political progress. History shows that bloodshed tends to fill the void left by the absence of hope. Well, for all the rhetoric the practical reality of Trump’s foreign policy is more guarded. So beyond a raft of trade deals in Saudi Arabia what have we really learnt so far. All the indications are, for example, that the move of the US embassy to Jerusalem has been put on hold. US Presidents have never talked about Israeli nukes and their danger posed to the humanity. Trump also never questioned the validity of Isabel possessing nukes illegally. For all of the president’s repeated condemnation of the Iran nuclear deal, is he really capable of walking away from it? A Trump foreign policy is still very much a work in progress. Much of Trump’s world view is now coming into a jarring contact with reality. This current trip is in large part ceremonial, it is very early in his presidency to be putting a toe into Middle Eastern waters. In all the speeches President Trump made during the trip there was no detail about how he might succeed when so many others have failed. So signs and symbols and implicit messages are being pored over for meaning. This is President Donald Trump’s first foray to the Middle East and of course it will not be his last. He has already got one thing clear. Adversity really does make strange bedfellows. Trump will end his tour on the Italian island of Sicily at the G7 summit on Friday.